When Conan O'Brien took over Late Night on NBC, Andy Richter was hired as one of the show's writers, then almost instantly promoted to sidekick. On Late Night, Richter was funny before O'Brien found his way, and some have suggested that O'Brien gradually grew into his role as host by absorbing some of Richter's easygoing style. Together, they helped popularize the all-purpose substitute obscenity "crunk". Richter left the program in 2000. Before Late Night, Richter's fame was limited to an amusing portrayal of Mike Brady in The Real Live Brady Bunch on stage in New York and Los Angeles. He met his wife, comedienne Sarah Thyre, when she played his eldest stepdaughter Marcia in that play. He has years of improv under his belt, with Annoyance Theater and Comedy Underground. 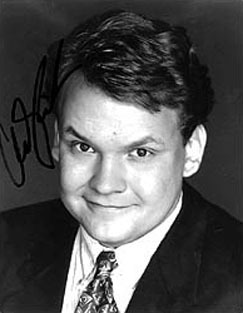 After leaving Late Night, Richter starred in two quickly-cancelled sitcoms, the critically-acclaimed but audience-ignored Andy Richter Controls the Universe, in which deranged daydreams spiced up his boring office job, and the universally-despised Quintuplets, where he was saddled with five unlikable teenagers. In late 2009 he rejoined O'Brien as sidekick on The Tonight Show, an assignment that ended in a messy way as Jay Leno took back Tonight and O'Brien and Richter were set adrift. He is now O'Brien's sidekick on TBS's late-night Conan show. Richter expressed his political opinions in a 1997 article in George Magazine: "Please, please, don't talk about politics. Because I'll just have to freshen my drink, take a leak, or, depending on the depth of convictions, go home and get a good night's sleep for that big day of unspecified network-television sidekick-type showbiz stuff that I've gotta do tomorrow. But I guarantee you, I will be gone."